Sweet potato toasts. If you are a sweet potato fan like I am, then this is the kind of breakfast trend you'll want to try. I mean, how can you go wrong with thin slices of sweet potato topped with whatever you can dream up? I cannot get enough of mine topped with Calabro's organic ricotta, hot honey, and pomegranate seeds. It's a warm, savory and healthy breakfast win. I was in a bit of a breakfast rut. So, it was on a lazy Sunday morning as I stood in the kitchen wondering what I was going to make for breakfast, that my eyes wandered to the sweet potatoes. The whole SPT (sweet potato toast) trend has been around for a while but I just never got around to trying it out. That morning seemed like the perfect time to finally do it. I scrubbed and patted dry a large sweet potato. Next, using my mandoline, I sliced it into lengthwise 1/4-inch thick pieces. I don't have a toaster and thought that turning on the big oven for this was a waste of energy. Instead, I used my trusty toaster oven. While the slices baked away, I considered topping choices. I could have gone full hipster with an avocado, but I'd been having avocado topped breakfasts a lot lately. I was out of any sort of nut butter. 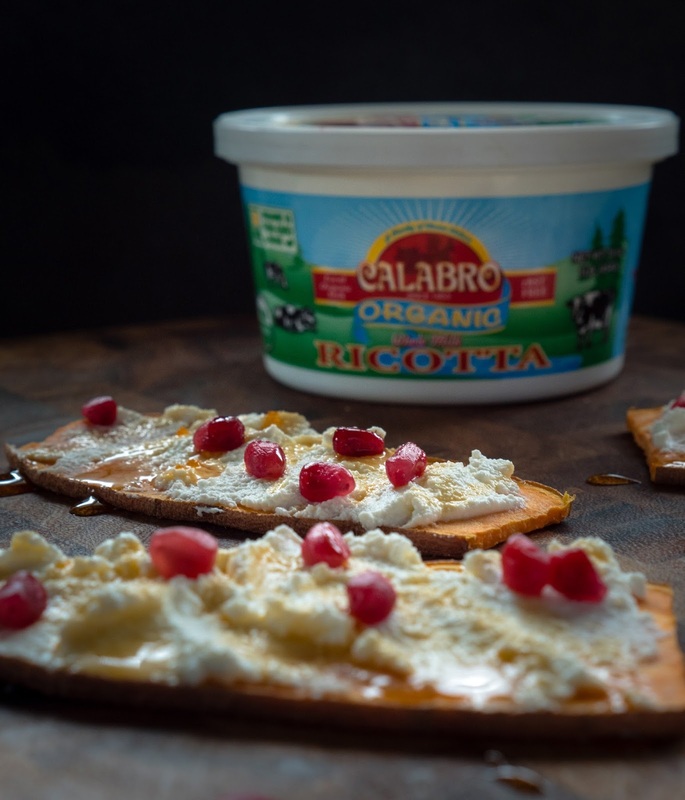 Then I had a lightbulb moment when I pulled a tub of Calabro's organic ricotta out of the fridge. 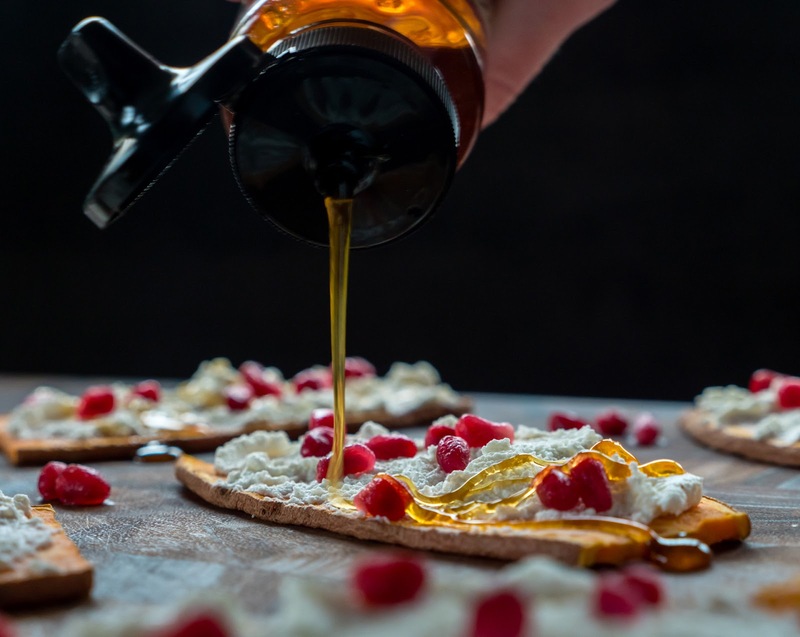 A classic Italian breakfast or snack is a piece of crusty Italian bread smeared with fresh ricotta along with some honey or jam or even something more savory like a sliced tomato and olive oil. It's one of my favorite things. I figured that same idea would probably be delicious on a sweet potato. I was right. 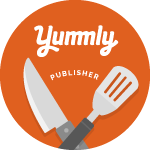 It's darn delicious! The toasted sweet potato slices held up well to a pretty heavy-handed spoonful of ricotta. Their sweetness was a perfect match for the creamy cheese. A sprinkle of pomegranate seeds added a little tartness and a drizzle of hot honey gave things just the right amount of heat. Drizzle each slice with 1/4 teaspoon honey and finish off with a pinch or two of sea salt. These sound delicious! 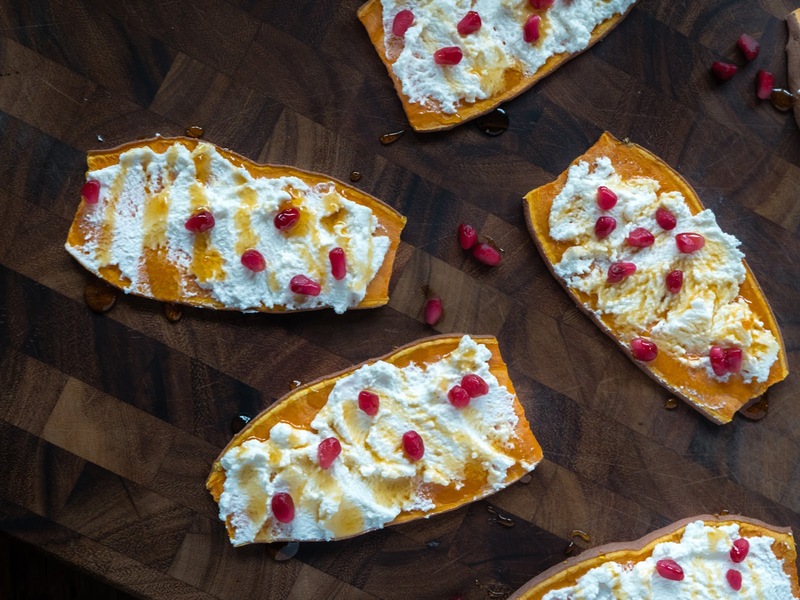 Love the idea of ricotta and honey — and a wedge of sweet potato! Can’t wait to try this!